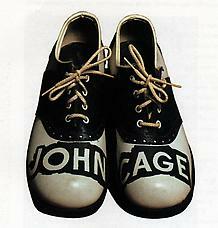 A Shoe: John Cage Shoes, 1977. Richard L. Feigen. When Ray Johnson plunged off a bridge to his death in New York's Long Island Sound on Friday the 13th in January 1995, he left his friends and admirers with a lot of questions. He also left behind an extraordinary life as one of this country's most unusual and influential contemporary artists, and a body of work that spans almost 50 years and includes countless drawings, collages and paintings. Johnson's life and work are celebrated by the Asheville Art Museum in the exhibit "Ray Johnson: Conversations," which opened late last month and continues through June 29. The exhibit, containing about 60 works, was organized by guest curator Richard Craven, an artist who formerly was an associate curator at the Southeastern Center for Contemporary Art in Winston-Salem. Patterson, Tom. "Art's In The Mail”, Winston-Salem Journal, May, 11, 1997. This exhibition was accompanied by an issue of Black Mountain College Dossiers. For more information about the publication, click here.